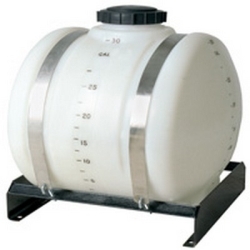 400 Gallon Horizontal Tank 42" x 76" | U.S. Plastic Corp.
HomePolyethylene Tanks Horizontal Tanks Round Horizontal Tanks 400 Gallon Horizontal Tank 42" x 76"
400 Gallon Horizontal Tank 42" x 76"
This 400 gallon horizontal tank is 42" diameter and 76" long. It has a .275" nominal wall thickness, weighs 115 lbs. and will hold up to a 1.7 specific gravity. It comes standard with an 8" vented lid and a 1-1/4" fitting in the sump. The cradle and bands for this tank is part #13112. 25 Gallon Horizontal Tank 23" x 22"
55 Gallon Horizontal Tank 23" x 38"
75 Gallon Horizontal Tank 24" x 47"
95 Gallon Horizontal Tank 24" x 56"
100 Gallon Horizontal Tank 23" x 64"
110 Gallon Horizontal Tank 30" x 44"
150 Gallon Horizontal Tank 30" x 57"
150 Gallon Horizontal Tank 32" x 52"
200 Gallon Horizontal Tank 32" x 68"
200 Gallon Horizontal Tank 38" x 51"
300 Gallon Horizontal Tank 38" x 76"
500 Gallon Horizontal Tank 48" x 79"